Static is not only annoying but can be severely damaging when it comes to sensitive medical equipment with fragile electronics. Can you relate to polyester pants legs creeping up, or annoying electrical shocks after walking on a carpet or plastic tile? Static is not only annoying but can be severely damaging when it comes to sensitive medical equipment with fragile electronics. Understanding static electricity first takes us on a journey to ancient Greece. Accumulation of static charge on amber after rubbing it with fur was first described by Thales of Miletus, a pre-Socratic philosopher. Static charge accumulates due to the so-called triboelectric effect, not surprisingly derived from the Greek words meaning rubbing (tribo) and amber (electron). 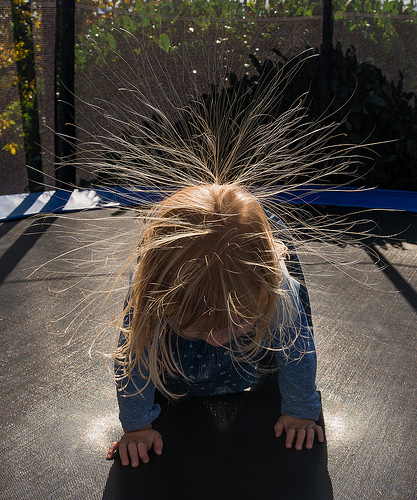 Static electricity is caused by the difference in triboelectric polarity of objects that come into contact and exchange charges to equalize the difference in their electrochemical potentials. After the objects are separated (if they are insulators), the charge stays on the surface, which can result in significant voltage potential. According to triboelectric series, examples of positively charged objects include hair, skin, glass, leather, silk, fur, nylon, and acrylic, while among negatively charged substances include amber, wax, rubber and most polymers (polystyrene, rayon, polyester, polyethylene, polypropylene, vinyl, silicon and Teflon). It is easy to see that skin or hair contact with many plastics inevitably causes an accumulation of static charges. Static electricity can damage electronics, and it also can ignite flammable fumes and interfere with radio navigation of aircraft. That’s where antistatic agents come into play. Antistatic agents make the surface of a material slightly conductive, either by being conductive itself, or by absorbing moisture from the air. Internal antistatic agents are mixed directly into a material, while external antistatic agents are applied to its surface. Obviously, external antistatic agents risk being stripped from some surfaces by cleaning and wiping. One would think an internal antistatic agent added directly to a plastic or composite would render the material permanently antistatic. However, this is not the always the case. Traditional internal antistatic agents are migratory in nature. Their molecules consist of a hydrophilic head (amine, amide, ester groups) on a longer hydrophobic aliphatic tail, and they work by positioning themselves with hydrophilic polar groups on the surface, attracting moisture and dissipating static by ionic conduction. Their migratory rate is determined by the length of the aliphatic tail. With time they migrate to the surface and can be eliminated with surface wiping; they can contaminate human skin. Also, since they depend on moisture for functioning, they work better at higher humidity. The PEBA polymer additive used in Foster’s static dissipative blends disperses throughout the entire base polymer. When melt blended in quantities between 10 and 20% by weight into other polymers it provides immediate and permanent antistatic properties of 1010-12 ohm/sq, depending on the loading and the base polymer. These antistatic properties are maintained in the polymer blend even at low humidity levels. This unique polymer additive can be compounded into other polymers with compatible melting temperatures, including thermoplastic polyurethanes (TPU), polyethylene (PE), polypropylene (PP), polymethyl-methacrylate (PMMA), acrylonitrile butadiene styrene (ABS) and polyvinyl chloride (PVC). Though undoubtedly useful, this type of antistatic polymer additive is not unique. Apparently, Foster is not the only company using PEBA to make inherently antistatic polymers. An international polymer company, Arkema, which has divisions in France, the U.S., China, Japan, Korea, and Taiwan, uses a similar Pebax® polymer antistatic additive in several dozen formulations in a variety of polymer matrices, with several blends having food and USP Class VI approval. According to Arkema group social media hub, “Antistatic Pebax® forms a 3D ionic conductive network within the host matrix which allows for the dissipation of charge.” Biocompatible Pebax®, used for medical applications has unique properties. It can be sterilized by ethylene oxide process, steam, or gamma radiation; it is lightweight, flexible and chemically resistant; and it also is breathable (waterproof while permeable to moisture vapor) and nonporous (used as microbial barrier protection). Although we might never know who really was first in developing nonmigratory antistatic additives, it is good to have a choice of stable nontoxic static dissipative polymer blends not only for medical devices and equipment, but for many other applications.